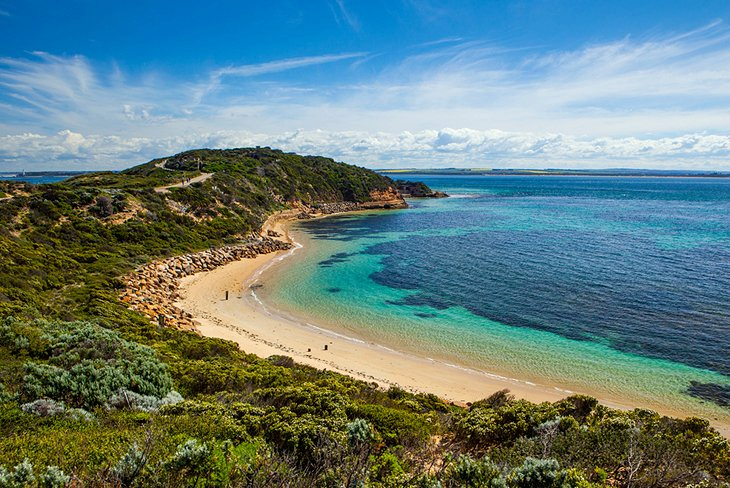 If you are looking for a holiday destination that has it all, from wildlife, stunning scenery, wineries, family fun activities, surfing, pristine beaches, waterfront dining and plenty of water fun, then come to Phillip Island for a holiday to remember. This island off the coast of Victoria is easily accessible 365 days a year from Queenscliff / Sorrento via the car and passenger ferry that regularly does trips over to Phillip Island or via the bridege which links its eastern shore to the mainland, but you can also chose to charter your own flight or ride by helicopter. Phillip Island has long been one of the best holiday destinations in Australia as it is somewhere where you can wine, dine, be entertained, shop, sunbake, go hiking, view an abundance of wildlife and enjoy numerous styles of accommodation to suit all travellers. Whatever your interest and tastes, Phillip Island is loaded with so many wonderful things to see and do, you will not know where to start first. From the pristine beaches to the wetlands, from the National Parklands to the interesting communities that dot their way around the island there are numerous delights to take in. Take time out to view the march of the penguins at sunset every day as they make their way up the beach to the sand dunes to nest for the night. With the islands birdlife, kangaroos, wallabies, koalas and many more land dwelling animals along with seals, penguins, dolphins and sea lions that inhabit these waters there is every chance to get up close and personal with all types if wildlife during your holiday here on Phillip Island. Swim with dolphin and seals one morning and then go snorkelling or scuba diving that afternoon! Or perhaps a horse riding adventure is something that interests you or a food and wine tour around the island sparks your interest. From wetland boardwalks to scenic coastal walks to even doing a trip out to Churchill Island which is connected to Phillip Island by a small bridge where you can visit local farms, get amidst many different species of animals, hand feed ducks, chickens and sheep and even do a ranger guided tour of the small island. Walk through the treetops at the Koala Conservation Centre, base your holiday around one of the motor racing events such as the V8 Supercars or the Moto GP for all your racing enthusiasts and for anyone who simply cannot get enough of the water there is swimming, surfing, fishing, cruises and excellent boating to be enjoyed while on holidays on Phillip Island. You can wake to stunning views each morning no matter where you are based around the island as the island accommodation is perfectly placed for you to take in its natural beauty. There are apartments, luxury resorts, exclusive hotels, holiday homes, town houses, cruises, camping, backpacker hostels and hotels to be booked into that all range in price no matter what your budget might happen to be. Phillip Island is somewhere where all tourists can come to, to enjoy the many spoils and delights that have put this number one tourist destination on the map. Plan to escape away from the rat race, revive the senses, bring the family for an unforgettable holiday filled with adventures and excitement or perhaps a holiday luxury and indulgence is something you are searching for. Phillip Island is a place for all occasions so find out about all of the attractions, activities and year round entertainment that you can enjoy for your next holiday!